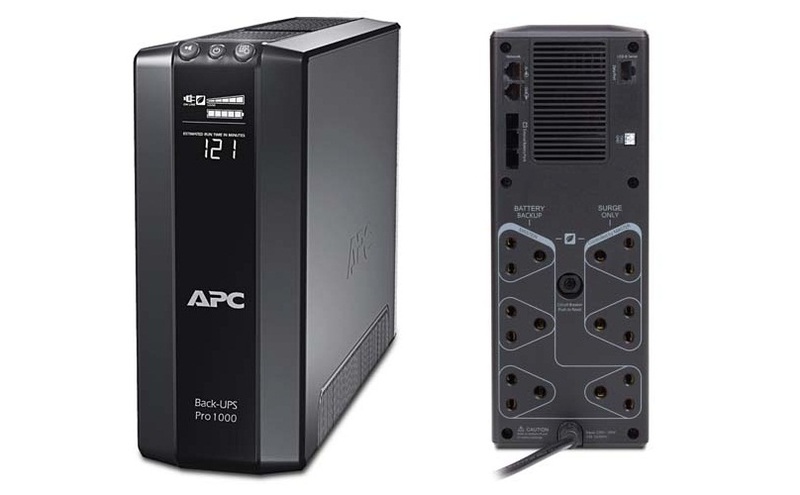 APC Back UPS 1000 (BR1000G-IN) from APC is the best UPS in it’s class available in India that I had the pleasure of reviewing. Attractive, full black color neat look with a LCD display on the front which displays input voltage, output watts being consumed, percentage of watts consumed, minutes remaining with current battery backup and current watts and energy conservation features make the BR1000G-IN the must to have UPS choice for every PC user. If you're looking for the best UPS for your high-end PCs under 600Watts consumption BR1000G is the best. But if you are having ultra high end PC with higher power consumption I would recommend BR1500G with 865Watts of output capacity for you. Now let’s have a look on what features does APC Back-UPS Pro 1000VA BR1000G-IN have for us. Easy recovery from overloads - Resettable circuit breaker, no need to replace a fuse. Boost and Trim Automatic Voltage Regulation (AVR) - Eliminates voltage fluctuations as a source of AV signal degradation and component power-supply stress. Green mode - Operating mode that bypasses unused electrical components in good power conditions to achieve very high operating efficiency without sacrificing any protection. Efficiency - 80% on Full Load and 84% on Half Load achieved by using Line Interactive Topology. Turn ON /OFF Audible alarms - Alarm providing notification of changing utility power and UPS power conditions, can easily be tuned on or off according to your mood. USB connectivity - Provides management of the UPS via a USB port for Windows only. Software shows real-time current power consumption, estimated battery backup time, automatic PC shutdown and many more.